The intelligent control variable frequency positive pressure cabinet is integrated with HMI, PLC and frequency converter. It can realize the frequency conversion control mode of the mud centrifuge and make the operation more user-friendly. The customer can select different rotation speeds and differential rotation speeds according to the site material conditions. 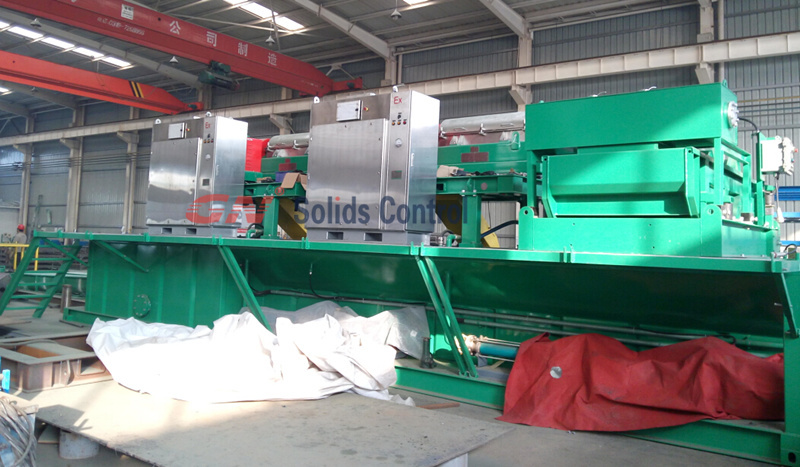 The automatic control makes the equipment more widely applicable to the site. The customer sets the host speed 0-3200r/min according to different materials, and the differential speed is arbitrarily adjusted at 10-45r/min; the status screen automatically reminds the maintenance parts of the centrifuge maintenance parts and alarms. Make up for the staff’s negligence to bring about the damage to the equipment; The alarm screen shows the fault alarm when the electrical equipment has problems, which is the user can find the problem in time. The inverter needs to dissipate a lot of heat during normal operation. The inverter requires the best performance at a constant temperature (typically 40-50°C). How can the heat be transmitted in a confined space? There are two types of heat. Methods; a) Heat exchange b) Cooling through the outside world. It is the explosive gas that can enter the shell, but the flame gas can not be transmitted to the outside through the joint surface during the explosion. That is, the explosion-proof body can prevent the flame inside the box from spreading out after the explosion, but the explosion inside the box will be damaged. Components are also a loss. To ensure that the pressure of the instrument gas inside is higher than that of the outside world, that is, the pressure inside the box is higher than the outside of the box. The concentration of explosive gas outside the box cannot enter the inside of the box or the concentration of the explosive gas enters the explosion limit, so it is not Poor students will explode. In general, the positive pressure explosion-proof control cabinet seems to be more troublesome than the explosion-proof control cabinet, but it is safe and reasonable.